Recent iPhone advertising has been promoting the handset utility that iPhone Applications create - using the strapline 'theres an App for that.' iPhone music creation has been highlighted recently with Gary Go (the iPhone musician) due to appear at Wembley stadium this summer and Paul van Dyk even creating an iPhone DJ app - however, the latest phenomenon is iPhone art. Jorge Columbo is not the only artist creating on iPhone though. 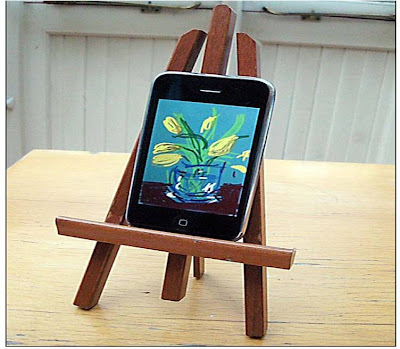 Reknowned UK artist David Hockney is also creating iPhone art - sending friends flowers and other pieces he has created! David Hockney is showing his digital pieces (including his iPhone art and Photoshop creations) at a museum event in London called 'Drawings In A Printing Machine.' However, digital art (note - a phrase David Hockney isn't keen on) is also being showcased in virtual venues too. There is a Flickr Brushes Group for art created using the Brushes iPhone App, as well as virtual showcasing of Hockney pieces in Second Life thanks to the efforts of KK Jewell. 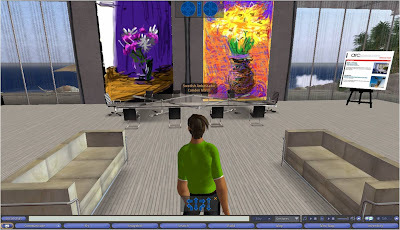 KK Jewell is on the 'Hockney List' and now has some of the Hockney iPhone digital flowers hanging in her Second Life, virtual ArcSpace office - more immersive / impressive than just viewing on an iPhone screen! (SLurl Direct link here). The offline exposure (and online buzz) has driven sales of these iPhone art Apps. 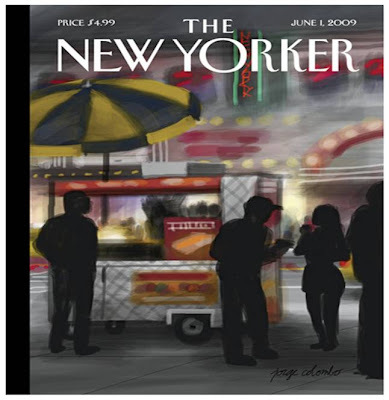 According to the New York Times, Brushes normally sells around 60 or 70 copies a day, but after the New Yorker iPhone cover, 2,700 copies sold in a single day. This is far higher than when the Brushes App was promoted in the iPhone App store - an example of how offline, online and mobile all now blur together and drive sales along the way. Furthermore, iPhone art is yet another example of how the iPhone has changed mobile consumption. It's no longer just about calls or even mobile internet usage - the mobile medium is now the facilitator for digital creation, particularly creation on the move.